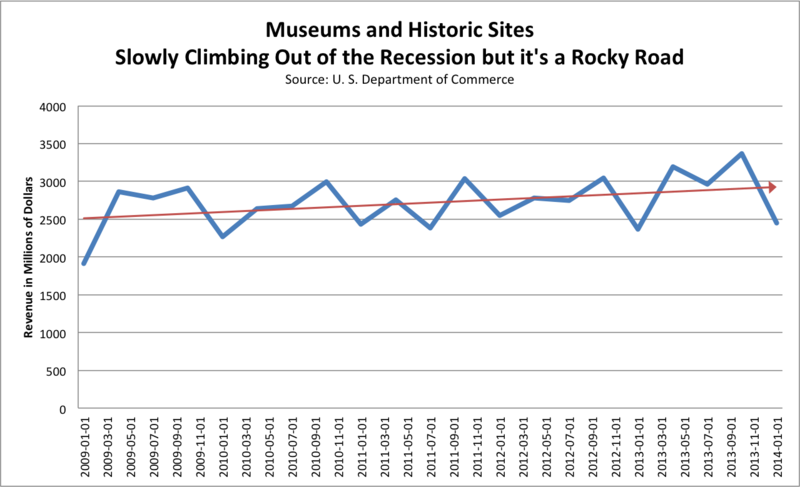 According to data from the U. S. Department of Commerce, museums, historic sites, and similar institutions are climbing out of the 2008 recession but it’s been slow and rocky. For 2009, quarterly revenues averaged $2.6 billon and for 2013 it grew to an average of $2.9 billion per quarter. The overall upward trend is slow (red line in chart) but each passing year has improved. Annual revenues have grown from 1 percent in 2010 to 7 percent in 2013 when compared to the previous year. On a quarterly basis, however, it is a very rocky road. Within a single year, revenues fluctuated 18 to 38 percent, suggesting that while revenues are looking better over the long run, in the short run it remains unpredictable. Please keep in mind that these numbers are national (so performance will vary by region or type of institution) and is based on a calendar not fiscal year. This benchmark should be one of several used by your institution to measure performance. Note on terminology: “Revenues” represent all sources of funding (e.g., admission fees, donations, store sales, endowment earnings). “Income” is the difference between revenue and expenses. Data wonks: The data source consolidates revenue for “museums, historical sites, and similar institutions” (terms whose definitions vary) who are exempt from federal income tax; data is not adjusted for season or inflation; and quarterly reports are given on the first (not last) day of the quarter (so the data could represent the previous rather than current quarter). For more details, I strongly recommend investigating the data source. Source: “Total Revenue for Museums, Historical Sites, and Similar Institutions, Establishments Exempt from Federal Income Tax, Millions of Dollars, Quarterly, Not Seasonally Adjusted,” U. S. Department of Commerce (available from Economic Research Division, Federal Reserve Bank of St. Louis). This entry was posted in Fundraising, Governance and management, Performance measures and tagged Revenue, U. S. Department of Commerce on August 13, 2014 by Max van Balgooy.